This recipe is from America's Test Kitchen with minor modifications. Everything I have made of theirs is delicious! My husband and I bought their Cooking for Two book off Amazon. I doubled the recipe to have leftovers because it warms up great for lunch at work! Start cooking the rice or quinoa. Cook onions in oil until softened (5 minutes). Mix in garlic, garam masala, ginger, and cayenne and cook until fragrant (30 seconds). 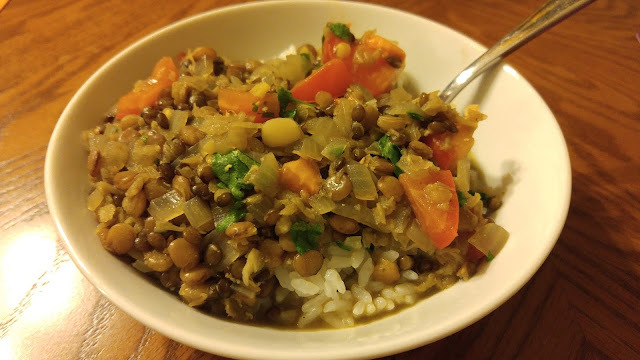 Stir in broth and lentils. Bring to a boil, reduce heat, and simmer 20 minutes until lentils are tender. Remove from heat and stir in the tomato, cilantro, and butter until the butter is melted. Serve over your rice or quinoa! * Buy pre-mixed lentils (brown, red, black) or buy them individually in the bulk section and mix them yourself (which is cheaper). They have a variety of textures and flavors that I just love in this dish! The Kitchen Sink and Beyond!